I thought I read Volume I of Montgomery's journals last year but apparently it's been two years. 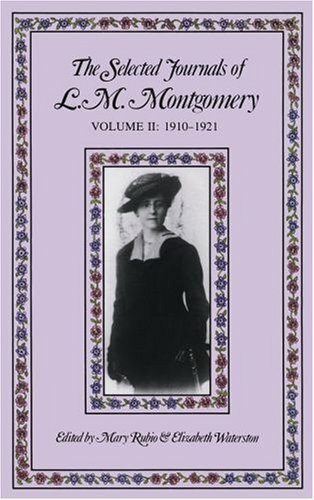 I went back and read my thoughts/review of The Selected Journals of Lucy Maud Montgomery: Volume 1 to try to re-engage with her personal story. The Selected Journals of L.M. Montgomery: Vol. 2 covers eleven years of Montgomery's life - from 1910 to 1921. In some ways, this was a much harder set of journals to read than the previous volume. Of course, having read The Gift of Wings (a biography - linked to my review), I knew what was coming but reading a biography is quite different from reading a person's actual thoughts and emotions on any given subject matter! In Volume I, Montgomery was a young girl, a teenager, whose head was filled with hopes and dreams. In Vol. II we read along with Maud as she marries Ewan MacDonald, becomes a mother, lives through World War I, loses her best friend and begins her legal battles against her first publisher, Page. Her life concerns are greater. Her emotions are deeper. She is consumed with responsibilities unknown to her previously - and she is mostly unhappy. "This is the end of 1912. It has been the greatest year of my life - the year that brought me motherhood. I faced death in it - and came off conqueror, bearing as my guerdon a new and unspeakably precious life. So it to me must always be the annus mirabilis - the wonderful year." She did revel in motherhood a great deal, delighting in her two small sons - Chester and Stuart - with great enthusiasm. (She did have a third child who was still born.) Other than motherhood though, she took delight in very little excepting the company of her cousin and best friend, Frede. I will give her this - as a minister's wife she had a hard time making genuine friends. There were a great deal of expectations placed upon her head and she felt unable to make close friendships. She complains a great deal about the woes of being a minister's wife and how duty and responsibility seemed to outweigh what I would consider honesty at times. If she were sick and miserable and felt like she had taken on (or been given) too many responsibilities, she never spoke up for herself. Drawing boundary lines seemed to be outside the realm of reasonable for a woman in her position. Nowadays we would take special care not to expect so much of one person, and certainly we would expect a pastor's wife to speak up if she felt overburdened. Instead of expressing that she was wilting under the enormity of the tasks she was expected to fulfill, she pressed on, outwardly smiling and generally leaving the congregation with the impression that she had it all together. Her journal was her outlet, her sole place to unleash her emotions -whatever they might be. The strain of that is unimaginable. I can well imagine that she felt depressed and alone, without the solace and comfort of good friends if she didn't feel herself in a position to share her real life, thoughts and struggles with the other ladies within her church. It was difficult to read about. On the flip side, she also found the company of others to be tiresome. She felt things so deeply and passionately (take the War for instance) that she rather resented and abhorred anyone who did not share her same passions. She seemed to have a very difficult time being around people who didn't feel as she felt, or thought as she thought. She writes about such people in her diary with disgust. I think with an attitude like that she is equally to blame if there were certain walls between her and the other women in her community. She could not share and she would not share her life. Of course she was lonely. And that is very sad. Towards the end of this selection of journals, we start to witness Ewan's mental decline. Montgomery confesses in her journals that she did not love Ewan - never had and wouldn't. However, she was fond of him. She liked him well-enough as a companion, but did not share her innermost thoughts or arguments with him. She saved all honest communication for her relationship with Frede - her closest friend and exclusive confidant. The last two/three years in particular of this journal she devotes a great deal of energy in keeping Ewan's mental anguishes a a secret from others - further building up walls and keeping people away from the family. She did not want others to know of his torments and odd behaviors and she was terrified that he was mentally unstable and that she had borne children with him, potentially passing on mental unbalances to another generation. She tormented herself endlessly over these issues and I think, in some ways, worried herself unnecessarily. She did not allow for others to come up alongside her and support her as she attempted to support Ewan. Least I give off the picture that this entire journal is full of woes and sorrows (although I do feel like it is) there were very interesting tidbits scattered throughout. "The Americans are a noisy nation. I had heard and read this and now I found it out for myself. They do not seem able to enjoy themselves unless there is a tremendous noise going on about them all the time. Even in the restaurants there is a crash of music that you have to shriek to be heard. No wonder "The American Voice" is notorious. I cannot but think such a constant racket most injurious. One may "get used to it" but the bad effect on nerves must remain." I also enjoyed a passage in which she detailed what she based various places on in her first book (and my favorite!) Anne of Green Gables. I also thought it was interesting that she had originally entitled Anne of the Island, Anne of Redmond and was perturbed when her publishers changed the name. Reading her impressions, emotions and anguish over the events during World War I was both wearisome (she felt it acutely) and fascinating. Reading this particular portion of the journal made Rilla of Ingleside come alive. Montgomery would re-read her journal for notes and inspiration as she wrote Rilla and it was very intriguing to find so many little quips and antidotes and sometimes direct quotes in the journal. I was glad that I had just finished reading Rilla so that it was fresh in my mind. Like last time, upon finishing a Volume of her journals, I am glad to have read it. Any false impressions I might have ever had about Montgomery might be blown away, but then I feel like I can truly enjoy Anne and Montgomery's other works for what they are - without any misconceptions about who the author was or what she believed. I find Montgomery to be fascinating and wearisome. I confess I was glad to come to the end of this particular volume because her lamentations about life in general were generally starting to wear me out! Still, it is done. I'm not sure if I'll pick up The Selected Journals of L.M. Montgomery: Volume III: 1921-1929 for next year's challenge, or space it out a bit. I find that I can only take so much "direct contact" at a time. This year I particularly enjoyed diving back into some of Montgomery's fiction and it made easing into this reading year an all together pleasant experience. We shall see what next year brings! Wow. I knew she likely committed suicide, but this just is shocking with how delightful and hopeful her works are. I can understand her isolation as a minister's wife. It's sad really. What's even sadder is that it still happens today. Too bad we can't let our faith leaders and their families just be ordinary people with their own set of struggles and sins. Reading your thoughts about her journals makes me wonder what people would think of me by reading my journals. I don't usually write about fun and exciting things. Generally it's the stuff I'm struggling with. So I think my journals wouldn't give an accurate view of my thoughts and life any more than my blog gives a fully accurate view of my life. RtK IS my journal these days. I don't keep a written one. Used to but destroyed the ones I had written and decided against writing anymore. And I'm glad to have RtK although it certainly doesn't express me thoroughly. So good point. It's hard to know her exclusively, although she did write long entries more honestly than any other journal I've ever seen. She was a writer, after all. So i think we can get a GOOD picture, although not a complete one, as you say. Sounds intense. Without the support of friends, a deeper, sharing relationship with her husband, and a genuine relationship with God, it's almost no wonder she ended up taking her own life. I still hear the sentiment today that pastors and their wives should not have closest friends among their congregation lest others in the church get jealous or lest they get so close to some that they tend to show favoritism or make excuses rather than rebuke as needed. That may be true, but they need close friends somewhere, if not in their own church. The biography I am reading now says that LMM edited her own journals and did not include everything in for publication that was originally there. Barbara H. - Yes. That's true. But I have the distinct impression that she didn't replace that much. What she seemed to do was to remove some references to certain people that she thought would be incriminating in the future. The introduction to the journals I'm reading seems to indicate that she removed references about her husband and sons - people who were close to her. I don't begrudge her that. The journals I have are edited when the editors thought she was being a bit verbose. (The journals are still LONG but they would shorten certain descriptions of places.) I kinda wish that they had left them entirely alone so that we could just have it like it was. I don't think too many pages were removed - but some were, yes. It is my CURRENT understanding that she removed fewer pages towards teh end of her life because she knew that her journals were going to be of interest to others so she wrote accordingly - leaving out references I suppose she would not want others to know of. Early on though, she had no reason to suspect that anyone would ever be interested in her journals. Until Anne became popular, that is! What strikes me most as I read your post is how basically normal Montgomery's feelings were. Given the circumstances, she was right to feel lonely... isolated... overwhelmed. Probably all of us feel those things at times. But it's sobering to realize how far it all spun out of control in the end for her because it was not dealt with. A good reminder check in with myself and be the shaper and chooser of my responses, rather than the one controlled by them. Wow...very interesting! I confess I've never known much about the woman behind the writing. For next year's challenge I'm going to have to add some books about her.